Tuesday November 6th: Brian Hayes MEP for Dublin announced today that he will not be contesting next year’s European Parliament elections at the end of his mandate as Dublin MEP in the parliament, and will be taking up a new role with BFPI in April 2019 as "central to Ireland’s continued economic recovery must be a healthy, sustainable and customer focused banking sector". "I am looking forward to working with the BPFI team and the Financial Services industry as a whole, to help reposition the sector as a crucial driver for real investment and growth in Ireland’s future. 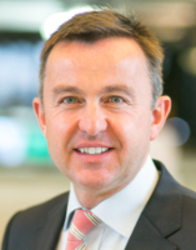 As Deputy Finance Minister and Vice President of the Economic and Monetary Affairs Committee of the European Parliament Brian Hayes was one of the pivotal voices in the European Parliament progressing financial services reform, one notable area being in the reform of legislation regarding Money Market Funds, a role referenced recently by a number of his regulatory counterparts at the FCSDublin, 2018, Dan Gallagher, former US SEC Commisisoner, and Gareth Murphy former director of markets Supervision at the Central Bank of Ireland who worked with him on the reforms. Brian Hayes: "central to Ireland's continued economic recovery must be a healthy, sustainable and customer focused banking sector". "There comes a time for everyone in politics to leave the stage - for me that time is now", he said. FIBI Annual Lunch: [L-R] Tina Fordham, Managing Director and Chief Global Political Analyst, Citi and Colin Moreland, chair at FIBI. Fordham spoke about the implications for investment markets and economic growth of key geopolitical and socioeconomic factors that are currently at play - including political risks, global trade tensions US Mid-Term Elections and Brexit. "Being elected to public office is a great honour. I have never taken it for granted. I remain deeply grateful to the trust placed in me by the public in each of the eight elections I have contested. It has been a privilege to serve Fine Gael as a Councillor, Senator, TD, Minister and MEP. "I am taking this decision for family and professional reasons. There is life after politics. Speaking today at the annual lunch of the Federation of International Banks in Ireland (FIBI), a constituent part of BPFI, FIBI's chair Colin Moreland said "we look forward to working with Brian and the BPFI team in supporting the International banking sector in Ireland in the coming years". "Yesterday I informed the Taoiseach and my Party Leader, Leo Varadkar of my decision. I want to thank Leo for understanding and respecting my decision. I also want to thank the Fine Gael party for their support during my political career. I have made many friends in politics and will always cherish those friendships. "My party has never been in such a healthy condition. Fine Gael is forward looking, in touch with Irelands mainstream and articulates a strong modern pro-European narrative for our country. Great things will continue to be done under the leadership of Leo Varadkar and his colleagues in government. "We now have certainty on the makeup of European Constituencies following the recent report of the Boundary Commission. Fine Gael now have time to select a new team for the Dublin constituency for next May’s election. My announcement today leaves the way open for new people to represent Dublin in the European Parliament. "I gave a promise to the people of Dublin that if elected in 2014 that I would serve a full five-year term in the European Parliament. I stand by that commitment and therefore will serve out my mandate. "Under the Article 50 procedure, the European Parliament has the power to ratify the final Brexit deal. All Irish MEPs must continue to make the case for Ireland in their respective political groups across the European Parliament. I am especially conscious of my responsibility as an Irish MEP, given what is at stake for Ireland, to continue in my role until the Brexit outcome is known. "At the end of my mandate in Parliament, I will be taking up a new role as CEO of the Banking and Payments Federation Ireland (BPFI). Given my work over the past 10 years as opposition spokesperson, Deputy Finance Minister and Vice President of the Economic and Monetary Affairs Committee of the European Parliament, I understand the important role and responsibility of the Banking and Payments Industry to Ireland. There are clearly very big challenges facing the Irish Banks, especially around the questions of trust and confidence. There is a big job of work to be done in this regard. However, central to Ireland’s continued economic recovery must be a healthy, sustainable and customer focused banking sector.